I have a small hyrdo-garden; tomatoes, orchids, basil, parsley. Ebb and flow system. Can I use worm tea instead of the chemicals in my watering solution? What is the NPK (Nitrogen, Phosphate and Potassium) of Worm Tea (in general, I know this will vary from farm to farm)? Comments for Worm Tea for Hydroponics? I've used worm tea for hydroponics, in both the traditional method and the Kratky method, with good success. I'd like to hear from others, especially researchers in this area, since it seems like such a good idea. It also would be great to find a reliable analysis of worm tea and what it provides to plants. Leachate vs Worm Tea, I just learned the difference. Also read: "Without a doubt vermiponics works best in conjunction with aquaponics." Have you gone that route as well? The Kratky method looks like one short step to aquaponics. Thanks for posting your pics. Although I haven't tried hooked on ponics yet, your system looks very fun. I won't begin to comment on NPK ratios as not all worm tea or worm castings is created equal and therein lies the difficulty of determining NPK ratios as it would be a guess at best. As I was saying worm tea, when brewed correctly, can and does create a type of Super Food for plants in a hydroponic, aquaponic, or vermiponic system. But here is one thing that concerns me with your question RJ. You asked, "Can I use worm tea instead of the chemicals in my watering solution? Yes, I use worm castings, alfalfa meal, and rock dust to make tea, so I'm not using leachate. 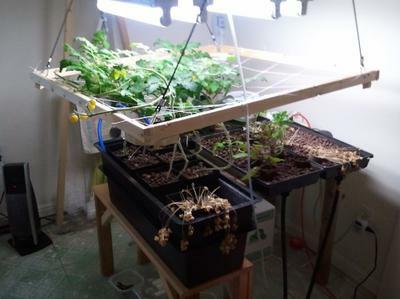 Kratky's method works well and is nice in water-restricted areas, and is a nice way to go for folks who don't want to mess with pumps and pipes. Introducing microbes to the hydro system? My last post was cut off for some reason. Anyway, I know the chemical fertilizers kill microbes. I'm not sure you would want to start now. Introducing the microbes to the hydro system may stall your plants for quite some time. You would be changing their food source and it just may take a while for them to adjust. Chemical fertilizers are high in salts and ammonia. Not very microbe friendly just keep this in mind. If it were me, I would just start over. Clean the system of all chemicals and just go organic with worm tea and castings and minerals. Thanks for all your input. The plan is to start-over, going organic with worm tea and castings and minerals. There will also be a very small side foray into aqua. For now I'll continue with ebb and flow but I want to test my bathes for N/P/K in San Francisco. Any suggestions? Home Kit? Check with your local county's extension office. Call the numbers listed in the link below. They will probably steer you in the right direction and maybe get someone to test for free. But don't worry about the NPK ratios of worm tea. If brewed properly the only fear you have is drowning your plants. Well, I have been "playing" with hydroponics for the last 25 years and was never able to find viable and affordable organic alternatives to the commercially available water soluble fertilizers necessary for hydroponics. That is until 3 years ago when I discovered composting red wiggler worms, and I set up my first worm bin. I definitely do things contrary to popular advice of separating out the worm castings, put them in a sack and soak with a bubbler for 24 hours --- way too slow and too much trouble. I just installed a valve near the base of one end of my 36 gallon plastic worm bin and every morning pour about 5 gallons of water over the top of the worm bin. I leave the valve open and draining into a 5 gallon bucket and VOILA, instant and abundantly available WORM TEA without all the mess and hassle. Plus my worm bin stays fresh and moist and I don't have to disturb the little buggers too much. For the last 3 years I have used nothing but my Worm Tea for both my small hydroponic fence top garden (20 feet of 4 inch pvc pipe with 2 inch holes cut every 3 inches and solar powered) and my 14 container Patio Garden with excellent results. I also seem to have almost no pest problems, I guess they just don't like worm tea. Anyway, it works. Just don't worry about the analysis as it really doesn't matter, as long as you have such spectacular results as I have had. If your water is iron or magnesium deficient, you could add some mild steel nails and epsom salts to your solution, but I'm not sure if even that is necessary. The worms seem to have it all, somehow, almost miraculously. Hi, only now I see the comment function, so I can as well ask here, as in my email before. I have read the article leachate vs worm tea, very interesting. Because not all worm tea (which is really "leachate") is created equal. I'm won't repeat what's already been said in this thread, or I might. If I tell you to use your leachate because mine worked for me it doesn't mean that it will work for you. Most leachate sits in the bottom and stagnates for a while then people decide to put it on their plants with either success or failure. There is a war going on inside a worm bin and the good microbes are out populating the bad microbes. Eventually the good microbes win but during the process bins that are too wet (for various reasons) have leached liquid down into the bottom reservoir. Because the bottom reservoir is not aerated like that of the worm bin, the bad microbes begin to multiply and the war is back on. Only this time the bad guys will win because this is their playground (environment). All food in a worm bin is different and all aeration, temps, & moisture levels are all different. No one knows what is in the mysterious liquid when it first starts to drip in the bottom container. Again, if the bottom is leaching then the bin is too wet. Now, why does it seem to be working for the guys in the link you have provided? Because this has to do a lot with the way they collect it. It's NOT your normal leachate (they call it worm tea or worm juice I believe). They are also using a food source that most do not. They are using animal manure which has a lot of beneficial microbes already before going into a worm bin. Here's the difference. It's not setting in the bottom to become anaerobic and stagnant. They are collecting it from the bottom and recycling it back over the worm bedding where it has a chance to be reprocessed. So it rejoins the "war" and looses more and more each time it's thrown into the fight. Not only do the bad guys loose but beneficial microbes leachate from the bottom more than the unbeneficial microbes. Here is another reason why they are having good results. Over the years I have noticed from my readers that the leachate tends to do better with ornamentals than garden plants that we eat. This is because they have a bit of a different diet. Ornamentals just like a different source of microbes which may be a little more on the anaerobic or acidic type of foods. This isn't always the case though. It just depends on the plant. You may have to do a little bit of research for that. One thing I do want to note is that there bins were a bit on the wet side and that's why you see a lot of small white worms (pot worms). These are okay if they are not too numerous. I hope I've helped you to understand this a little bit more so that you can make a better decision. Here is a method for using the leachate from the bottom of your bin if you absolutely must. P.S. If they were to add just a couple of steps more by aerating and adding molasses to there leachate they would have so much more beneficial results. Wow, I am most impressed! Thanks very much for that elaborate explanation. I have learned a lot now and feel very encouraged to DO it. Though I have no real use for it so far, I am just interested. But since you mentioned ornamental plants... I planned to raise some, like Japanese maples and the like. Could be interesting to see how they are doing. Only use it on a few secluded plants before you use it on all of them. It's best to experiment with the batch so you know it is safe to use. Thanks Gunter, Yes definitely keep us posted on the "Leachate Tea". The NPK of worm tea has proven to be largely irrelevant. What matters is actual empirical evidence, proof by results. Worm tea works in hydroponic systems as my past 3 years of experiments have proven. I have been growing hydroponically, actually vermiponically, in 4 inch and 6 inch PVC systems filled with Perlite and fertilized with nothing but Worm Tea. But not worm tea made by the traditional method of separating out worm castings, putting in a "sock" then in a bucket with an air stone and running for 24 hours or more, all very time consuming, tedious and inefficient. I simply have a large 27 gallon plastic worm bin where I recycle my kitchen wastes. I pour at least 5 gallons of tap water through it daily, collect the runoff via a valve on the low end of the bin. This I call Worm Tea and use it to fertilize my Hydroponic system. This gives me Organic and Natural Fruits and Vegetables at Zero costs and Minimal Effort but with Amazing Results...try it, you'll see. When running 5 gallons of water through your worm farm are you losing a lot of worms (drowning?). No worms are lost & they seem to enjoy their daily "shower" where their various waste products are washed away. In fact they like this environment so well, I have yet to see them "run" as long as I leave the lid off and "don't fence them in" as the old Roy Rogers Western song says. Hydroponic & earthworm castings bag ?? If i were to put EWC (amount ???? ) in a flow through bag into my hydroponic 3 gallon tank that has off the shelf Grow A & B formula , in the tank are also 2 airstones pumping air and theres also a venturi recirculating pump, would there be any notable difference from the EWC for the plants ? i would change the mix weekly with the off the shelf A & B grow mixture. Just read all of the comments, I am new to Hyrdo/aquaponics, started last year, I did a lot of reading on worm castings. Not knowing what I was doing (still don't) I set-up two home made hydroponics bins (bought at home depot), let the water aerate for a couple of days, placed a bag of worm castings into the water with a air-bubbler, put in my plants, (basil, parsley) and watched them grow. I have never seen basil grow so big and or green. not sure if what I did was right but it worked for me. I am now starting my own worm bins in the basement and trying both hydro/aquaponics with grow lights. will let you know if this works. thanks for the great info. Bulldoggy, not sure what you mean by "Grow A & B formula." If it's chemical you may very likely be "poisoning" the very microbes you're are trying to encourage. There's a very early piece of advice I received from Pauly in this thread about not mixing the "off-the-shelf" nutrients with worms/tea. Not sure if anyone will respond since posts are over 2 years old but Ill give it a shot. Could worm tea be used in the kratky method with good results? Since there is no oxygenation of the water reservoir I wonder if adding the worm tea would change it to anaerobic after a short time and cause harmful microbes to develop. I ask because of reading about the other post on "leachate vs worm tea" and how the oxygenation process of brewing keeps harmfuls in check. Anyone have ratios of worm tea to reservoir water volume? I want to try a kratky method hydroponic using a shallow plastic tub with spots for 5 lettuces. What I have heard is that at this years NCSU Vermicomposting conference, Dr Norman Aracon released data showing that aerated casting tea can help cut use of chem fert by up to 25% - but I do not know what % volume of your res. to add it. Castings themselves have generally a 1-1-1 or 1-.5-.5 NPK ratio. but it isnt the NPK that gives you your bang-for-the-buck; it is the microbes, enzymes and compounds to be found in vermicompost. These will increase a plants uptake of NPK from other sources, strengthen the plant and increase it's "brix level" - lessening it's reliance on chemical pesticides. It will resist disease and pest better when using worm products. ATM, until my ornamental fish population grows, I am feeding a capful of seasol (a seaweed plant tonic)per week into my system. I also add a handful of castings to the bottom of each plant if they look a little undernourished. I have to do this as the system doesnt have enough nutes yet for the plants. If I find the info you are looking for, I will come back and post. The ONLY WAY to make Worm Tea! You shouldn't worry about the NPK or any other measure of the effectiveness of Worm Tea on your Garden except how well it is growing and how well it looks. Those are artificial measurements NPK, etc. created by our Artificial Society and Artificial Science. Does it work, or does it not work? This is the Question! PS: IT WORKS!!! Leave all of that other crap alone and make your own worm tea fertilizer daily. I get at least 5 gallons DAILY by ignoring all the Idiots, the supposed Experts at Worm Tea and just pour Copious Amounts of water daily through my 27 Gallon "Tote" Worm Bin and Harvest it as Worm Tea, Beautiful, Simple, Natural, and Virtually Labor Free vs their Alternative. Just Be Sure to Feed Them as Much Vegetative Waste as Often as Possible to keep them Happy and they will reward you ABUNDANTLY!!! Brian the Worm Man- Thank you for your response! Bummed to hear that worm tea will only make up about 25% of nutrients. I was under the impression from some of the posts on here that people were feeding their plants strictly worm tea and having good results. I'm trying to find a completely self sufficent system that does not rely on outside inputs. Wonder if my homemade fish emulsion I make every year could be added to the worm tea to make up the nutrient deficiencies? 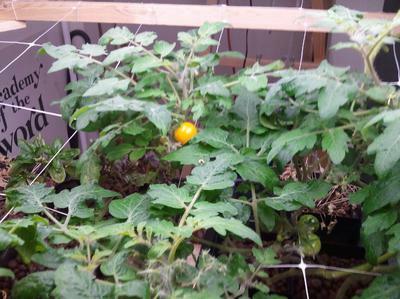 Michael- Are you growing hydroponically? What are you growing? Do you rely on any other fertilizers to feed your plants? I went back and reread all the posts and there's something I want to be clear about. The terms "worm tea" and "leachate", for some people, are synonymous and for others, will mean two separate things. Like I mentioned earlier, these terms will remain a hot topic for a very long time, but they are two entirely different processes. 1. Leachate is the liquid that pools under the compost and can become anaerobic, smelly, and filled with several unbeneficial microbes and sometimes will be just fine. 2. Worm Tea, as defined by most serious worm composters, is worm castings suspended in oxygenated water for a period of time for the extraction, multiplication, and concentrations of beneficial microbes. However, when defining "worm tea" in a more understood description for its specific application, should be labeled as Aerated Worm Tea (AWT) or Actively Aerated Worm Tea (AAWT) and the list goes on and on. I want to be clear about the different forms of "tea" in this thread. I just discussed Leachate and AWT, but I personally would not consider the act of pouring water over a bed of castings (for extracting nutrients) leachate. Nor would I call it worm tea, AWT, or AAWT. Maybe a more accurate term would be Liquid Diffused Castings (LDC). This would be pouring water over the bed of castings to extract the beneficial microbes for use in hydroponics or just simply watering your plants. This certainly has benefits when done properly, but I can't tell people that it will be successful without a few caveats. For years I've told my readers, if they're going to use leachate, to dilute it by 10:1 water to leachate. Some worm composters have no idea how mature a bin is or what ratio the beneficial microbes out populate the unbeneficial ones. If there's several unbeneficial microbes, slight anaerobic smells, high acidity levels, etc, there's a good chance this will kill or make plants sick. This is why I NEVER tell my readers to use the leachate or I would surely have several upset at me. I've seen the effects of leachate personally and that of my audience. A hydroponic system contains a big buffer of water so the risk is quite low should there be high amounts of unbeneficials. All worm systems are different and are at different composting stages so to say to someone to flood there system or let a little water pass through the bedding is risky. They should be experienced at worm composting first and have a good knowledge of the stage of their worm system at all times. So why go through the trouble of bubbling water for 24 -36 hours. The purpose for this has always been to multiply the beneficial microbes in such copious amounts in order to introduce it into the ground so that the right kind of microbes populate and feed your plants. This really only needs to be done 3 times per year (in ground) at a bare minimum, but more is better, to a certain degree. I've never said that you HAVE to brew tea and use it in your garden but the results are absolutely stunning. Just like we culture the worms and give them a more favorable habitat, so do we culture the microbes and give them a more favorable habitat. Doing it this way gives us amazing castings in a solid form and amazing microbes in a liquid form which is readily available for plant intake. One way is a slow feed (time release), and the other is an extremely nutritious fast-acting plant food all in one shot plus stimulates the surrounding areas of the ground to produce more of the right types of microbes. So I'm definitely not saying that liquid diffused cast is wrong, but quite the opposite IF the user knows exactly what is happening and understands their system. As for the NPK ratios, Brian and others are spot on. Plants MUST depend on certain elevated NPK ratios because the surrounding ground is dead (if you will) and produces nothing for the plant. In nature, a plant's roots adapt to surrounding microbes. It gets a feel for what food is lying around and exudates its own substances and stimulates certain microbes to produce more or less. More bacteria or less fungi, etc. and their must be plenty of food sources for the microbes to populate in many variables. Castings can be a low NPK ratio but really means nothing as these are the right food types for a plant which becomes the building blocks throughout the plant's life. What an informative read a great big thank you to all the posters. What if you need a lot of worm tea, like a couple hundred gallons, I've searched and only find bulk worm castings, not tea. Anyone know of anyone brewing this stuff on a large scale. Not sure if they sell tea but their worm farm is fairly large.